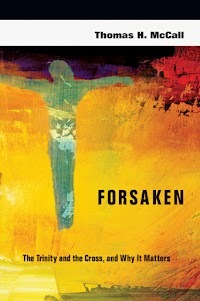 This post continues the series exploring the book Forsaken (The Trinity and the Cross, and Why it Matters) by Tom McCall. For other posts in the series, click a number: 1, 2, 4, 5, 6, 7, 8. Last time we looked at two arguments that McCall uses to defend the view that God the Father did NOT abandon his Son at the cross. Now we'll look at his third argument, which has to do with understanding that Jesus' cry of abandonment (My God, my God, why have you forsaken me?) should be understood as referring to the full message of Psalm 22, not just the one sentence. In support of this view, McCall cites Matthew's and Mark's accounts. Clearly, both intend that their readers understand that the events at the cross echo the entire message of Psalm 22. 17 I may tell all my bones: they look and stare upon me. 18 They part my garments among them, and cast lots upon my vesture. Surely the foresakenness is real in some sense. But in the midst of this apparent despair, the psalmist also recognizes that God is the "Holy One" (Psa 22:3), and he recounts the testimonies of those who have trusted in the Lord before him (22:4-5). He details the conditions of his plight--the mockery and misery of his state are on full display (22:6-18). Turning again to Yahweh for help, he asks the Lord to bring deliverance from "the mouth of lions" and salvation from "the horns of the wild oxen" (22:19-21). But his time he calls all Israel to praise Yahweh, and his trust in the Lord is evident in this crescendo: "For he hath not despised nor abhorred the affliction of the afflicted; neither hath he hid his face from him; but when he cried unto him, he heard" (22:24). For the psalmist, there can be no mistake--the Lord is faithful and steadfast and has not despised or scorned the suffering of the afflicted one. The Lord has not rejected or abandoned him, for he "has listened to his cry for help." And this is, for the psalmist, in comparably good news. It is good news for rich (22:29) and poor (22:26). It is good news for the children of Israel and for foreigners alike (22:27-28). And it is good news both for the present and for future generations (22:30-31). So we should take Jesus' quotation of the first lines of this psalm as a signpost to the whole psalm. Jesus announces once again the meaning and significance of his mission.... This cry tells us of Jesus' voluntary self-identification with sinners.... Jesus asks the question, not on his own behalf, but as the question asked by those with whom [he identifies]... Jesus, as our high priest, stands in our place, on our behalf, facing our sin and our death while unprotected by his Father [however]... we should not conclude that Jesus here announces the Father's utter abandonment or forsaking of him (McCall, pp40-42). A Christo-centric understanding of Psalm 22 is that it proclaims the gospel--the truth about Jesus, and through him the truth about us that God the Father, through his Son, not only does not abandon us in our sin, but hears our cry, draws near to us and delivers us out of death. Indeed, it is very good news that Jesus has taken on our flesh, and in doing so born our sin and shame--all the way to the cross and the tomb where he bore the full weight of our fallenness. Indeed, the Father abandoned Jesus to this suffering and death on our behalf. However, in doing so, there was no separation between the Father and his Son--the Trinity was in no way split asunder. Indeed, the Father, remaining close to his Son, heard Jesus' cry and delivered him--through death on to resurrection and ascension. And so we proclaim that in Jesus (our substitute and representative) God is for us! He has not (and never will) abandon us despite our sin. Yes, in Jesus, we die because of our sin; but also in Jesus we rise from death to new life, and in him ascend to glory. This is gospel truth--believe it, receive it, and rejoice!